Find artworks, auction results, sale prices and pictures of Thomas Whitcombe at auctions worldwide. 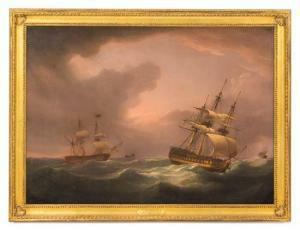 ATTRIBUTED TO THOMAS WHITCOMBE United Kingdom, 19th Century British 44 Gun Frigate off Dover". Unsigned. Attributed and titled on tag affixed verso. Oil on canvas, 34" x 40". Framed 39.5" x 45"." Condition Relined. Soiled. Repaired tear to upper left. Restoration throughout center. Frame as is with numerous losses and areas of loose gesso. Frame is likely to suffer further losses in the auction / shipping proccess and is not guaranteed to be in the same condition as photographed. 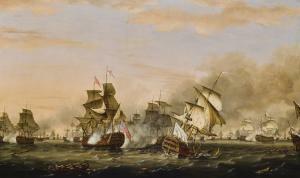 THE BATTLEOF THE SAINTS, 12 APRIL 1782;THE VICTORY OF ADMIRAL SIR GEORGE RODNEY'SFLAGSHIP 'THE FORMIDABLE' AGAINST THE FRENCH FLAGSHIP 'VILLE DE PARIS' Thomas Whitcombe LONDON CIRCA 1752 - CIRCA 1824 signed and dated lower right: ThosWhitcombe/1783 oil on canvas 73.1 x 123.2 cm. ; 28 3/4 x 48 1/2 in. Provenance Lord and Lady Gretton, Stapleford Park, Leicestershire; With Richard Green, London, by 2001; From whomacquired by the present owner. Catalogue Note Thomas Whitcombe was a prolific marine artist, though little is known about the details of his life. He exhibited at the Royal Academy most years between 1783 and 1824 and was one of the preeminent recorders of ships and sea battles of the French Revolutionary and Napoleonic wars. Here we are presented with the final sea battle of the War of American Independence, 1775–83, which was fought between the British West Indies fleet commanded by Admiral Sir George Rodney and his French counterpart, Vice-Admiral the Comte de Grasse. Rodney ultimately won the battle by employing his novel tactic of'breaking the line', which was subsequently adopted in the Navy as a desirable addition to fighting instructions, and which he is still remembered for to this day. Thomas Whitcombe THE EAST INDIAMAN, 'DUKE OF BUCCLEUCH,' JULY 2 ND 1797 LONDON CIRCA 1752-CIRCA 1824 signed and dated lower left: T. Whitcombe 1799 oil on canvas 22 by 36 in. ; 56 by 91.4 cm. Catalogue Note The Duke of Buccleuch did six voyages to the East from 1788-1800. 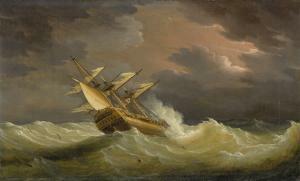 The incident here depicted would have occurred on her fourth voyage, under Captain Thomas Wall, on which she sailed from Portsmouth on 11 August 1796 and was back on moorings in England on 11 July 1798. Depicted in heavy seas, she haslost both foretopmasts and maintopmasts and, according to the coordinates given on the frame (Lattitude 17.15 north, Longitude 120.21 east), was somewhere in the China Sea/western Pacific, east of Formosa). A notice of items of "Private Trade" (not the main cargo) published by the East India Co 10 July 1798 (though appearing in \‘Prince\’s London Price Current\’ No 1161 of the 6th and also the 13th), records some of what The Duke of Buccleuch carried back from China, which included teas, spices and dye: \“350 chests and boxes Souchong; 149 chests and boxes Hyson; 10 chests Cassea Lignea and buds; 130 chests Hyson Skins; 144 chests Tea; 144 chests Congou; 1 cask Soy; 4 chests Cassia; 2 baskets Mace; 1 case Gamboge; 2 matted bundles Mats; 1 pipe Madeira Wine.\” We are grateful to Pieter van der Merwe of the National Maritime Museum, Greenwich, UK for his assistance in cataloguing this lot. Thomas Whitcombe (British, 1752-1824) A Squadron of the Royal Navy in Heavy Weather oil on canvas signed and T. Whitcombe (lower left) 25 3/4 x 36 1/4 inches. from Fairlawn, Lake Forest, Illinois Provenance: The Parker Gallery, London, 1987 Frame: 30 1/4 x 40 inches. Canvas was cleaned, lined, re-stretched, retouched and varnished by the Chicago Conservation Center in January 1998. Please request a complete condition report. 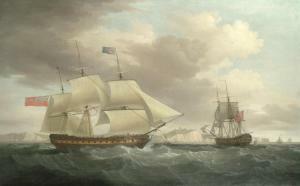 Thomas Whitcombe (British, circa 1752-1824) The East Indiaman Surat Castle in two positions calling for a pilot off Dover signed and dated 'Tho Whitcombe 1790' (lower right), inscribed 'The property of Major J.B. Paget 1837./Formerly the property of his maternal great-grandfather,/ Sir George Abercrombie Robinson, BART, M.P.' (on canvas verso) oil on canvas 107 x 169cm (42 1/8 x 66 9/16in). Footnotes The East Indiaman Surat Castle, 1149 tons, was built at Bombay for Mr John Innes and launched on 25th March 1788. Between that year and 1806, she normally traded between India and China, but - as a 'licensed ship' – sometimes voyaged to London. From 1807-11 she ran direct from London to China , but then made intermediate stops at Penang (1812-13) and afterwards at Batavia 1814-15. Resuming her direct London to China service between 1816-17, she spent her last years in the East trading between India and London. 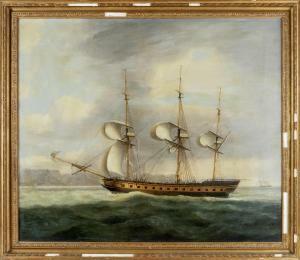 Sold to Bassett & Co. of London in 1825, she was then resold to the Mexican Navy for use as a frigate-of-War and renamed Libertador.